This section describes how mange Knox Platform for Enterprise licenses. See Knox features on Android for a full list of what features are paid or free. All features still require a license, regardless of if they are free or paid. 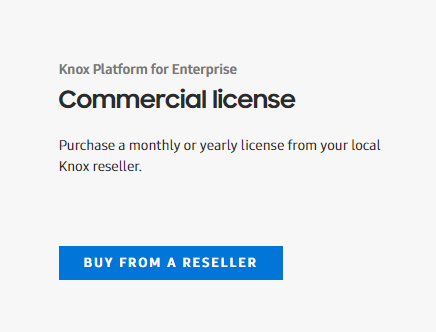 You get a Knox Platform for Enterprise license from one of our resellers. Alternatively, your MDM provider may have already bundled your Knox license keys in with your MDM purchase. Contact your supported MDM for more details. Once you have a Knox Platform for Enterprise license, you activate it in your MDM. Note – Your MDM may have already activated your Knox license key for you in your MDM profile upon purchase. Contact your MDM vendor to check if you need to input the license key manually. Register the Knox Platform for Enterprise license in your MDM console. 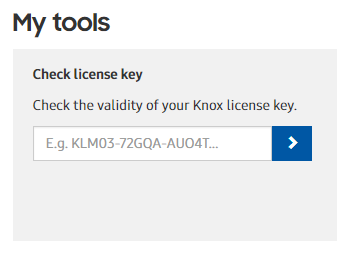 For example, this image below shows the license key page in Knox Manage. If you use Knox manage, this is where you paste in your license key. Log into your Knox Portal dashboard. Enter your license key in check license key box. How do I add more Knox seats (activations) to an existing Knox license key? 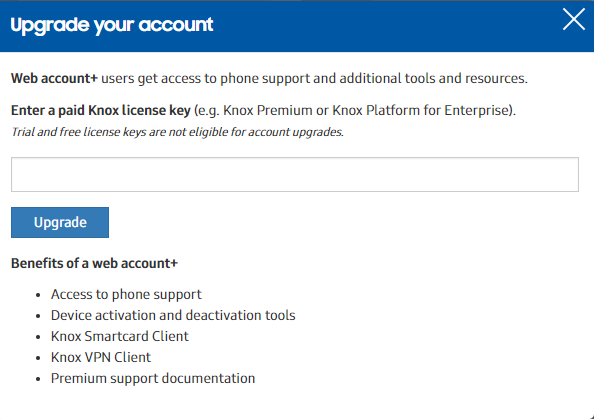 If you need more Knox seats (activations), you can simply contact the Knox Reseller you purchased your Knox licenses from and request them to add more seats to your existing Knox license key. You do not need to get another Knox License key to input into your MDM. For example, if you need 100 more Knox License seats because you need to provision 100 new devices, you can contact your Knox Reseller to request 100 more seats. Why do I lose a Knox license seat after factory resting my device? The device was factory reset without first being unenrolled from the MDM. By design, the license seat is not returned. Log in to the Knox portal with a Knox web account that has IT admin privileges and a Samsung Knox web account +*. Go to the Deactivate devices tool: https://www2.samsungknox.com/en/keep-remove-devices. Enter the license key and the IMEI number of the device(s) you have wiped. Use commas to separate each entry. *NOTE – this feature is only available to IT admins who upgraded to a Knox web account +. 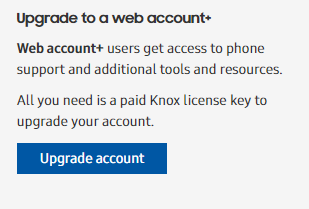 This is a free upgrade and only requires an paid Knox license key. To upgrade to this account. 1. Look for the tool-tip box on your Samsung Knox dashboard in the lower left corner of the page. 2. Click the Upgrade account button and enter your license key in the pop-up box. There are two types of Knox Workspace license; monthly and yearly, based on its billing period type. A monthly license renews itself every month; therefore, it does not expire unless the customer or Samsung deactivates the license on purpose or specific expiration date is set when license is ordered in SLM. However, a yearly license expires one year (or two years) after its activation date. If the license is not extended with an extension order and expires, the Knox Workspace container gets locked. But the data inside the container are not removed, and the user re-gains access to the container and data after the container is reactivated with an extended license. If a container exists, the container will be locked and inaccessible until you reactivate Knox Knox Workspace by purchasing a license. You cannot push any Knox Workspace policies to devices. All Knox Workspace policies set in the MDM admin console are maintained and can’t be updated.